We have been having some fun playing tourist. Exploring more of St. Augustine, and seeing a space launch were things earlier in the visit and ones that I previously covered. Since that time it seems we have been running nonstop, so I only now have managed to find a little time for another post. Sorry for the delay. 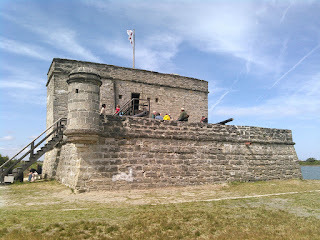 After the space coast, we went to see Fort Matanzas. This fort was the other half of the protection for St. Augustine as it protected the "back door" inlet at Matanzas that led to St. Augustine. Unlike Castillo de San Marcos, this is a very small fort whose purpose was to warn St. Augustine if enemies were coming. It, like the Castillo, is also run by the park service. Visiting this fort is free, including the ferry ride over to the island (ok, sandbar) on which it sits. The park rangers that were guides were very informative and made for a fun visit. My wife and I have seen manatees in the past, including in marinas where we have stayed. My parents have not, so we decided to take a trip to see the manatees at the Blue Springs State Park. It was a bit late in the season for the manatees to be hiding up in the river. As temperatures warm, they start making their way back to the coast. But there were a few that were still hiding in this spring off the St. Johns river along with the other fish that seem to enjoy the near crystal clear water. Silhouettes of Manatees under the ripples in the water. The day my parents returned home was also the first of the veterinary appointments for our older dog. In the past we had good luck with the CSU Veterinary Teaching Hospital in Colorado, so we made the two hour trip to Gainesville to visit a similar teaching hospital at the University of Florida. We've found that these sorts of facilities tend to be a bit more open-minded about problems and hoped the dermatology department might do something other than blindly go with the prior auto-immune system diagnosis that has produced no results. The down side of visiting a teaching hospital is that the visits tend to take all day. Seeing the students (who usually come in first and take a history and do some basic examinations) and then the doctors and finally having them go huddle in the back with other students and staff to discuss the case and determine a course of treatment is a time consuming process. But unlike most modern medicine, be it for pets or us humans, this process seems more thorough and interested in results than money. For all day care, the cost is usually the same as or less than the 15 minutes spent with the typical vet. A little time at the beach in between vet visits. They decide to take her off some of the medications she had been on (ones that didn't seem to be working much anyway) and also wanted us to see their internal medicine department. Of course, they couldn't get us an appointment with internal medicine until two days later. 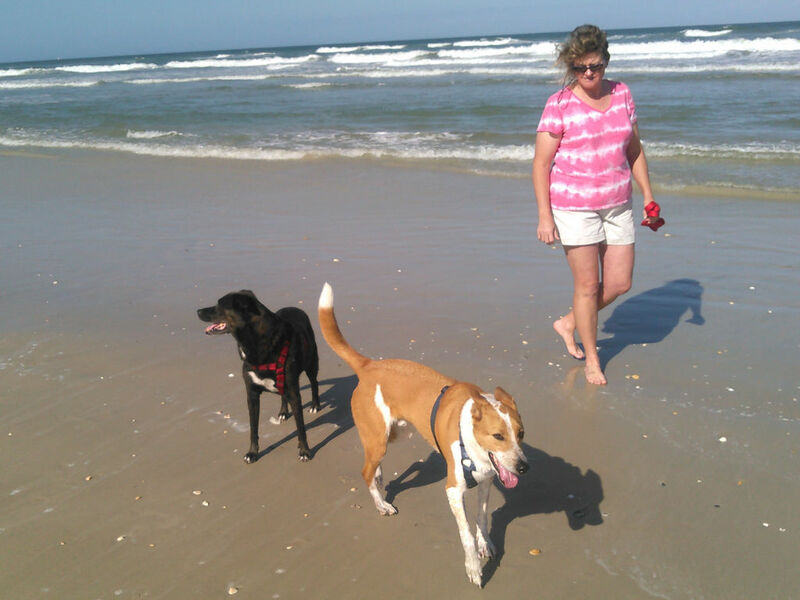 In between appointments, we decided the dogs could use a break too (they have been a bit neglected with the family visit), so we took them for a nice long visit to the beach. Another full day at the veterinary hospital, another round of tests, and now we wait on the results to see how to proceed. On the bright side, they don't think any cancers might be behind the issues. Unfortunately, there haven't been a lot of answers yet as we await the results of some tests. We're back at the boat now and family is back home so it is time to pick up where we left off. We've got a few repairs to do and some other tasks and then we will try to rescue a bit of the season before we have to head back north.